Darjeeling hill town is located at the northern part of West Bengal at an altitude of 6,710 ft. There is no airport or a regular broad gauge railway station in Darjeeling town itself. If you are visiting from other parts of India, you will first need to reach either New Jalpaiguri railway station, Bagdogra airport or Siliguri town, and then approach Darjeeling. There is no other way. While Siliguri is the main town close to Darjeeling, New Jalpaiguri (NJP) is the twin town of Siliguri and is the nearest major railway junction, and Bagdogra is where the nearest airport is located. All these three townships are located at the lower plains of Darjeeling. (1) Take a train up to NJP (New Jalpaiguri). Darjeeling is only 88kms from here. You will get ample taxis and shared jeeps from NJP to reach Darjeeling in about 3 hours. Few long distance trains pass through Siliguri as well. You will also get plenty of shared jeeps, taxis and buses at Siliguri (takes about 2.5 hours to Darjeeling). You can even take a toy train ride from either NJP or Siliguri through scenic mountain route that takes about 7 hours to reach Darjeeling. The toy train track runs parallel and next to the Hill Cart Road for most part. Check Toy Train Service for schedule and running status. (4) Reaching Darjeeling from Bhutan, Nepal & Bangladesh: Many tourists particularly foreigners combine a visit to Bhutan, Nepal or Bangladesh with that of Darjeeling. Often the Nationals of these countries also visit Darjeeling and Kurseong for admitting or meeting their children who study in boarding schools here. Reaching Darjeeling from such places may be cumbersome unless you are familiar with the routes and transports. Visit Reaching Darjeeling from neighboring countries to know about the approaches and transport options available to reach Darjeeling from Bangladesh, Nepal and Bhutan. The link will also let you know about the basic immigration & visa formalities that are required to cross the borders. Bulk of the tourists come to Darjeeling from Kolkata because of location proximity. Other than many short flights, even trains from Kolkata are quite convenient and take about 12 hours to reach NJP. Some trains like Darjeeling Mail offers a convenient overnight journey. There are also regular flights and buses from Kolkata. Darjeeling Tourism Card can offer you great discounts in station/airport pick up and drop service provided by several reputed operators in Darjeeling. The card also entitles you to great discounts in sightseeing tours & activities offered by the top operators, as well as in many great hotels, restaurants, bars and shops. Following links will give you details about all transport modes to reach Darjeeling from various places in India as well as journey details. 1) Kolkata to NJP/Siliguri & then Darjeeling: You can avail trains, flights or buses to get to NJP/Siliguri and the proceed to Darjeeling by local taxi or bus. Some prefer to take their own private vehicles all the way from Kolkata to Darjeeling. Visit the above link to get details of how to reach NJP or Siliguri from Kolkata, and onward road routes and transports to Darjeeling. 2) Trains to Darjeeling: Although Darjeeling itself doesn't have a long distance railway station, but there are many trains from various parts of India passing through NJP and Siliguri which are the two cities closest to Darjeeling. Here you will know about such trains that you can avail to reach Darjeeling. 4) New Jalpaiguri to Darjeeling: The onward transport options available from NJP to reach Darjeeling including private and shared taxis, buses, shared jeeps and even the narrow gauge Toy Train of Darjeeling Himalayan Railways. 5) Siliguri to Darjeeling: Siliguri is a twin city located close to NJP and also offers many convenient transport options for Darjeeling. Many tourists prefer to go down to Siliguri and then take a transport for Darjeeling. Siliguri itself has two small railway stations - Siliguri Town and Siliguri Junction. Siliguri Town is only 5kms from NJP. Siliguri Junction is further 3kms away and this is where most of the public transports like bus, private taxi, shared jeeps are available for Darjeeling. It takes about 3 hours to reach Darjeeling from Siliguri. 6) Bagdogra to Darjeeling: The road route and the journey from Bagdogra airport all the way up to Darjeeling. By taxi, it takes about 3 hours along the main hill cart road (NH-55) or via the Rohini route, unless you take stopovers. NOTE: Toy train to Darjeeling is available from NJP or Siliguri (which are about 30-minute by taxi from Bagdogra airport). Unlike Gangtok, there is no public Helicopter service from Bagdogra (or for that matter any place) to Darjeeling. 7) Bagdogra Airport: All that you can expect once you land in Bagdogra including airport facilities and onward transportation to Darjeeling & other places. State transport buses are available from Siliguri bus terminal on Hill Cart road. Pre-paid taxis are available at both Bagdogra airport and NJP station. Shared taxis (usually vehicles like Jeeps/Sumos etc) are available at NJP station and Siliguri stand. Toy Train can be availed from NJP or Siliguri stations to reach Darjeeling or an intermediate town like Kurseong. Visit Fares to Darjeeling to know about bus, taxi, shared jeep and toy train fares from NJP/ Siliguri/ Bagdogra up to Darjeeling. Check out Roads To Darjeeling to know about the roads that lead to Darjeeling from various points in the lower plains, directions, distances, landmarks on the way and lot more. 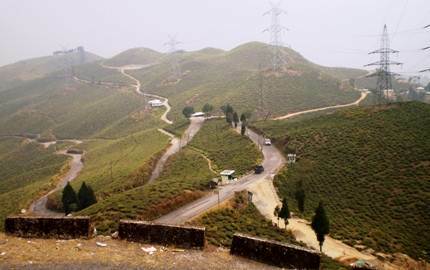 There is an alternative scenic route to go to Mirik from Bagdogra or NJP and then onward to Darjeeling. This route goes through several rolling tea gardens. It's a longer route and takes about 4.5 hours to reach Darjeeling. Visit Route to Darjeeling via Mirik to know all about this route and what you can expect to see along the way. 1) Returning from Darjeeling: The best options of returning from Darjeeling. Hello, I've been reading the posts here and been super impressed with your detailed replies. Thank you for this service! I have a question regarding getting from Gangtok to Darjeeling; I see the normal shared taxi route goes via Rangpo. Now I would quite like to see Samdruptse monastery (at Namchi) and was wondering if I could do this on the way from Gangtok to Darjeeling? I guess this would involve an early-morning shared taxi Gangtok-Namchi and then an afternoon shared (or private if needed) taxi from Namchi down to Darjeeling. My question to you is - is this feasible in terms of timings or would this take too long including an hour or two at Samdruptse? And do you know how much a private taxi from Namchi to Darjeeling would cost, and what the latest time is that they would depart? Thank you so much! Hello, You can usually get a shared taxi from Gangtok up to Namchi at the stand below MG Marg (usually available from 7am). If there aren't enough people to share a taxi, take one to Singtam and change to another one to Namchi. However at Namchi you need a private taxi to visit Samdruptse Monastery (it's little off the main route). It's unlikely that you will get a shared taxi from Namchi all the way to Darjeeling... you can take one up to Teesta bazaar and then a private taxi (shared ones are not always available) to Darjeeling. Although there is a shorter route from Namchi to Darjeeling (via Jorethang and Jamuni), unfortunately foreign nationals are not allowed to exit Sikkim through that route. You need to exit through Melli (the longer route). Private taxi fare from Namchi to Darjeeling would be in the range of Rs. 2400 - 2500. However you can save cost using a shared taxi up to Teesta Bazaar. Shared taxis are usually available (at the stands) until 3pm. Private taxis operate all the time but lesser after 6pm. Time wise the day plan is manageable. Hi Raj, Is it possible to drive from Pelling to Darjeeling via Ravangla and Namchi? We are short of time and need to reach Darjeeling the same day. Would appreciate if you could help with this. Hi, you can... from Jorethang you need to take the route via Jamuni and Tukvar Tea Garden... that stretch of the road is bad at several places and you need a large vehicle. But this route (Pelling - Ravangla - Namchi - Jorethang - Darjeeling) will take well over 7 hours and considering additional time required for lunch and other breaks, not sure how much sightseeing can you do along the way. Otherwise take the shorter route from Legship to Jorethang (via Sikkip) ... would take around 3 hours 45 minutes to reach darjeeling. Sir, is there any bus service from Gangtok to Darjeeling during night. And how much time will it take to reach Darjeeling by bus? Hello, there is no direct bus between Gangtok and Darjeeling. You need to take a bus from Gangtok all the way down to Siliguri, and from there another one to Darjeeling. Gangtok to Siliguri takes around 5 hours by bus and Siliguri to Darjeeling takes around 4 hours plus the change-over time. There are no night buses. All buses operate during the day time. It's wiser to take a direct shared taxi from Gangtok to Darjeeling (about 4.5 hours) instead of a long bus journey. Shared taxis too operate during the day time. Hi Raj, I have visited Darjeeling back in the mid 60s. I now wish to show Darjeeling to my husband. We are now senior citizens and although healthy would find trekking too difficult. However, we do like walking. We are considering visiting Darjeeling in mid March. Travelling from Delhi to Calcutta for a week or so. I am a bit puzzled as to how we travel from Calcutta to Darjeeling. Most posts seem to start in Gangtok or Siliguri. How do I get to these places (without private transport) from Calcutta. Do we fly to Gantock or Siliguri or what? Look forward to your response. Hi, you should take a flight from Calcutta to Bagdogra which is the nearest airport for Darjeeling. From there it's a 3-hour drive to Darjeeling. There are also trains from Calcutta to New Jalpaiguri which is the nearest railway station for Darjeeling... better take a flight. Greetings of the day, I will reach NJP at 7:45 am on 3 march 2017. Various tour planners suggested me itinerary and the day 1 of their itinerary is same - Transfer to Gangtok or Transfer to Darjeeling. But I read it is Just 4-5 hours distance so my rest of the day is wasting please and also the last day of the trip is wasting in only transfer. I will buy the return ticket at night hour. Is it possible to utilize both days ? Such as Day 1: Transfer to Gangtok via Namchi Sightseeing, and Last Day: Transfer to NJP from Darjeeling Via Mirik route sightseeing. And I'm visiting Pelling also. Is there any good place to visit while Traveling to Pelling From Gangtok, as well as for Pelling to Darjeeling. Please Help me in this , I'll be very grateful to you. You can consider the following plan to utilize time enroute to your destinations: NJP to Darjeeling via Mirik. Darjeeling to Pelling via Namchi. Pelling to Gangtok via Ravangla. Gangtok to NJP via Kalimpong. I found your website, comments and views extremely helpful in deciding tour to Darjeeling and Gangtok. I will be travelling in January 2017. I wish to have your comments whether should I travel to Darjeeling 1st or Gangtok 1st from Bagdogra airport starting at around 4:00 PM (My Flight Arrival, so Evening travel to Darjeeling). I appreciate your time and efforts to read and reply my query. Thank you so much. Hi, you can travel to either place first. However Darjeeling is nearer (about 3 hours) and in my opinion is a better choice in your case as this would involve driving in the dark. First of all thank you for providing all the information in great details. I would like to know if we are coming by private vehicle and if we happen to stay in place which is not accessible to vehicle then what are my option for parking my car at night. You need to park by the street-side and that won't be safe. Better take a hotel with parking facility. Parking in commercial areas won't be allowed. Hi, We are planning to come to Darjeeling in March third week. Needed to know whether it is better to travel from Bagdogra to Darjeeling or NJP to Darjeeling as far as the cost and time are concerned. Thanks. Time and cost to Darjeeling would be almost same from both NJP and Bagdogra, in fact the pre-paid taxi fare is the same. From NJP you can additionally get shared jeeps which are not available at Bagdogra airport. Hi Raj, I live in US and plan to travel from Kochi, Kerala to Bagdogda in 2nd week of June. Can I rent a car from Bagdogda airport for Darjeeling/Sikkim for 3 days. Hi, you can rent a car with a driver. But self driven car rentals are not available in Bagdogra or NJP/Siliguri. Other than self owned private cars, only local commercial vehicles with drivers are allowed for Darjeeling and Sikkim. Moreover there are entry restrictions in several places in Sikkim including in Gangtok for non-Sikkim registered vehicles. Hi, It's Darjeeling Mail (not Express) ... a good train. There is no toy train these days from NJP all the way up to Darjeeling. A part of the track is lying damaged in between. Option ... take a taxi (pre-paids are also available) from the station and go to Kurseong (takes about 1hr 45mins). You can take your lunch at the WB Tourist Lodge (nice restaurant with a view) and then take the 3pm toy train that leaves Kurseong station (located nearby) for Darjeeling.... takes about 3.5 hours. If this is too much of a hassle, then take a 2 hour toy train joy ride from Darjeeling itself on any day (there are 4 round trips on a day). Plan Darjeeling and Kalimpong or Gangtok (NOT Siliguri.... it's a messy crowded township and you will hate to spend a minute). I have plan to travel to Darjeeling on 18th May'14, my flight shall reach Bagdogra at 3.45pm, is it safe to travel to Darjeeling at that late evening with family. if not then kindly let me know which is the hotel to put in for the night in Bagdogra. Kindly let me know. There is no problem as such. You will reach Darjeeling by 7:30pm. But driving in mountains in the dark is not enjoyable. Sometimes fog can create visibility problems, but it's unlikely around that time. There are several hotels in Bagdoga. You can see reviews in Tripadvisor and select one based on your budget. You will be better off staying in Siliguri. There are far more options both with stay and restaurants. There is nothing much in Bagdogra. Hi Raj, In your earlier mail you mentioned prepaid taxis are available unless we reach at odd hours. We would be reaching at about 6 to 7 p.m. Though the schedule arrival time is 3pm but Barmer Gauhati exp. normally runs 3-4 hrs late. So arriving at 7pm, would we get transportation for Darjeeling from NJP ? Thanks again !! Warm regards. At 7pm, you might get private taxis outside the station. You will be better off going through a travel agent and booking a car to pick you up if you anticipate that you may be that late. But I would recommend not to travel in the hills after dark (mainly because of the fog problems around this time) and reach the hotel at night when there may be nobody to receive you. If you reach late at NJP, stay back at Siliguri and travel next morning. If you still decide to go ahead, call up the hotel and tell them that you will be arriving late at night and there should be somebody to check you in. Otherwise you will end up banging the doors whole night shivering in the cold. Hello Raj, Thank you for the information; The only thing now is the tricky question of getting to Darjeeling! Tom and I have been looking at the train timetables but honestly, it is a little confusing! From what we can see it looks like we would have to get a train (the Mail Express) to New Jalpaiguri then another one from there up to Darjeeling. It looks like both of them would take several hours; the first one from Kolkata to NJP an overnight one. Is this correct? How easy is it to book from overseas or would it be better to do this once we are in India?? Jane, You are mostly right. Let me clarify a few points. There are several trains from Kolkata to NJP, and most are overnight trains. Kolkata has two stations - Howrah (HWH) and Sealdah (SDAH). The best train is Darjeeling Mail which leaves from Sealdah station at about 10pm and reaches NJP at 8am. Although the name is Darjeeling Mail, it does not go up to Darjeeling. You will need to get off at NJP. From NJP, earlier there was a provision to take a toy train (Darjeeling Himalayan Railway or Mountain Railway train) that would take you up the hill to Darjeeling town. It took some 7 hours to reach. But that is not operational these days (track damaged due to landslides). So you should take a private taxi (although shared jeeps are also available and used mostly by locals) and go to Darjeeling (takes about 3.5 hours from NJP). Trains from Kolkata to NJP in October would get fully booked 2-3 months in advance, because that is the peak season and Darjeeling will be swamped by tourists. So you must buy the tickets well in advance. Use the Indian Railway website www.irctc.co.in to buy tickets online. We'll (5 persons) reach NJP around 7 pm from Kolkata by train. Is it possible to get a taxi to travel to Darjeeling at that evening? Hello, You will get the bus tickets from Tenzing Norgay Central Bus Terminus at Siliguri located on Hill Cart Road. Ticket price is Rs. 50-80 per person (depending on the route it takes. Presently Hill cart road to Darjeeling is closed and buses go via Mongpu). You will need to find out the timing at the bus terminal. Sir, Please inform me how to return from Darjeeling by bus/shared jeep to arrive at NJP Railway station by 7pm. You will get plenty of shared jeeps from the chowkbazaar (lower market) area as well as from Clubside Taxi Stand (across Gandhi Road Police Point). They leave frequently during the day time. So come to the stand by 3pm. Buses also leave from Chowkbazar area, but since a part of the Hill Cart road is closed since a long time, the buses go via Mongpu. Buses will however come up to Siliguri Tenzing Norgay Bus Stand. You will then need to take a taxi, auto rickshaw or a cycle rickshaw for NJP station (only 8kms away). So go to the Darjeeling bus stand a day earlier and inquire about the timings.